Time flies when you're busy. 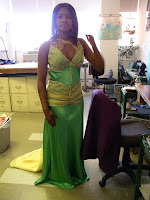 At work, it's prom time. When I last posted, I gave you a sneak peek of a little girl sweater. I still haven't finished the pattern, maybe later today. The yarn , again, is Aussie Sock. Main color is Spanish Fiesta. Contrast color is Cherry Tomato. I finally finished the Christmas socks for my Son. If he reads this blog, I hope he forgets by Christmas. 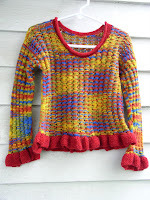 The yarn is Regia 4-ply in short colors. 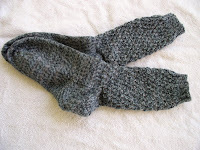 The leg is an adaptation from Charlene Schurch's Sensational socks book. I worked an 8 row pattern, she wrote it as a 12 row pattern. I may try it again, her way. with the toys being given to charity. I used a pattern from a New Zealand woman's magazine. It has lots of pieces to be sewn together, but I don't see any other way to do this one. I sewed a little and stuffed a little, and it turned into this! I had a little trouble, because I was missing one of the braid ends. 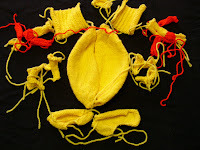 I reknit it. It still hasn't turned up. I'm knitting the Rainbow socks by Susanne Kitzmann, which originally was on Mag Knits. I don't know where the pattern is now. I using Kroy Socks in a Stripes pattern. Prom time - I have a few pictures. 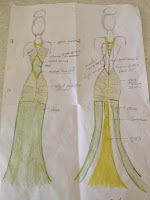 This prom dream started with a green dress and a picture. 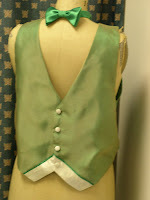 We also did a vest and tie for her date. 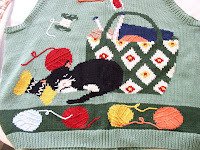 I is for Intarsia. The picture is the back of the SWAK Knitter's Vest. I loved it the minute I saw it, but it didn't fit my budget. One Christmas, DH and I exchanged catalogs, with wish list markings. I had marked this vest. He ordered it from patternworks. When I opened it, I pulled out the pattern and he said something about green yarn being back ordered. I was mystified. The pattern was for the 12 Days of Christmas, a cardigan. I loved that too. 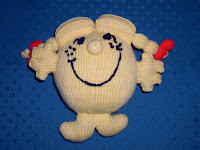 Sweetheart that he is, he contacted patternworks, explained the problem, and ordered the yarn for the Christmas sweater too. I quickly finished the vest and wear it often. It won Best of Class at the Ohio State Fair one year. It took 6 years to finish the other sweater, but I wore it last year. Pictures of the cardigan are on Flickr.